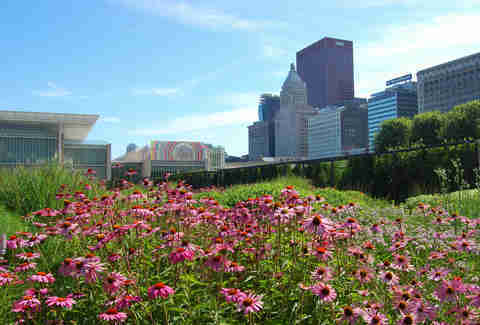 Sure, Millennium Park is tourist central, but there’s more to do than stare into the Bean or get hosed by creepy faces. 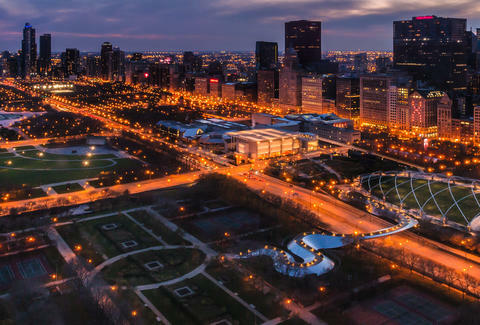 Bordered by the depth of the Downtown skyline, the lake, and sunshine, it provides the unbelievable concentration of music, food, movies, and art that makes Chicago incredible. Here’s our guide to 12 events and attractions in the park where you’ll stay clear of aimless fanny packs and beeline to summer relaxation. Here’s the plan: emerge from work on a sunny, 78-degree afternoon, grab a bottle of bubbly, a blanket, and groceries, then head over to a grassy lawn with your crew to watch the sunset and listen to a weekly mix of indie, world, electronic, and rock artists. Oh, this is real life. Maybe try to take it easy on Fridays (after all, isn't summer in Chicago just one big weekend anyway?) and wake up early, bring a banana and a towel, and enjoy the morning sun with the wakening city by participating in one or all exercise classes led by a rotating cast of local teachers. These energizing sessions are even regularly accompanied by live music. And afterwards? Perhaps you move those newly toned muscles to bike over to The Doughnut Vault... you deserve it. Grab a blanket, friends, some Garrett popcorn and a six-pack and set up camp in front of a 40ft LED screen as the sun goes down. Each week’s pick is intended to psych you up for upcoming events, such as showing Almost Famous before the park explodes with Lollapalooza or The Aviator before the skies are swarmed with the Chicago Air & Water Show. But get excited to start with your childhood favorite, Back to the Future, in honor of its 30th anniversary. Grab dinner at nearby Italian Village (mini bottles of Prosecco and flatbread, please) or an always $3.50 PBR tallboy at Rossi’s Liquors (yep, River North has a dark and divey bar/retail spot hidden between classy eats and a 7-Eleven) to discuss your newfound information on raptors and wildlife... wait, raptors?? Yes, raptors. As an extension of the Downtown Sound Series, the city is teaming up with renowned musicians as they perform commissioned projects and highlight pieces by young aspiring musicians. Definitely continue your Downtown Sound tradition of Bring Your Own Cheese Plate and Cooler. 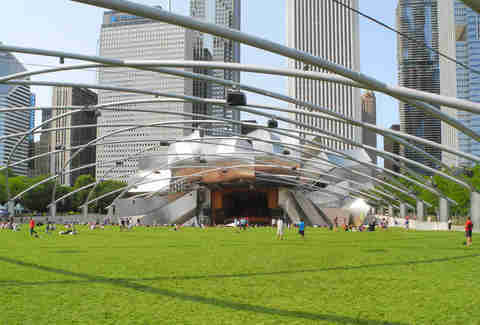 Now in its 81st season, the GPMF is providing a summer of classical favorites, internationally renowned musicians, and world premieres. While actual seats in the Pavilion require a ticket, you can still sit out on the lawn and enjoy an excellent evening of eavesdropping, gloved pinky finger up. Also the festival’s lunchtime rehearsals are worth abandoning a cubicle for. You knew you could get to the lake easily by sheer proximity, but did you know this hidden bridge leads you right to it without having to perform death-defying Columbus Ave crossing runs? 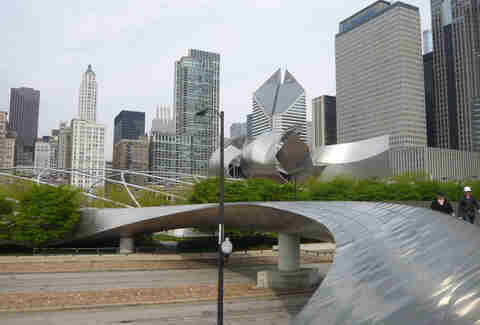 This winding walkway connects to Daley Bicentennial Plaza across Columbus Dr so you can easily waltz over to the LSD bike/walk path for some sports, games, or motivational running. This eclectic mix of musical performances ranges from mariachi and folklórico (you just might have to hear it to figure out what that genre is), to Broadway and dance, to an evening of NPR's award-winning quiz show, Wait Wait... Don't Tell Me!. Dress to the nines, or show up in lakeside skivvies and prepare your ears for the allure of talent. Immerse yourself in epic proportions of incredible jazz music by the world’s most talented musicians. This year will feature a tribute to the legendary “Lady Day,” Billie Holiday, and performances by the likes of Bobby Hutcherson and Dee Dee Bridgewater. Brush up on those Charleston dance moves, sip on a French 75 or Clover Club, and consider working knickers or a flapper dress into an outdoor festival situation. This comedic, talented, and possibly G-stringed Franco-Norwegian duo will make you believers in their circus take. Between juggling, trapeze-ing, and acrobat-ing, they’ll definitely up your lunchtime entertainment game, clown-free. Catch the rest of the three-day festival at Chopin Theatre and Athenaeum Theatre. While Chicago Gourmet is incredible, it’s also pricey. You could just go to this gem event and watch 12 of Chicago’s best bartenders compete for the best Tiki cocktail, while surrounded by 10 chefs turning out their most delicious and unique of pig roast offerings. There’s no better way to say farewell to summer than drenching your palate in island pours and succulently charred pork. Bet you didn’t know this whole 1,500 seat underground theater even existed behind the Pavilion. Oh it does, and its devotion to music and dance ensures that citywide and international troupes perform weekly, including Joffrey Ballet, Hubbard Street Dance, and Chicago Opera Theater. Purchase tickets and put on your fancy pants for a night out in this underground theater space. Be on the lookout for one-time events held on the rooftop of the spectacular lobby throughout the summer.